T/C .309 JDJ topped with forward-mounted Bushnell Elite 4200, 2.5-10X scope in Weaver mounts (top). Super lightweight .45-70 topped with Burris FastFire II, rear-mounted to increase already wide field of view (bottom). I would venture a guess that a higher percentage of FUR-FISH-GAME readers ramble up and over the mountains than is true for the hunting public at large, and when these active outdoorsmen think about a new rifle, packing weight is very much a consideration. When I am hiking the hills for deer, my favorite is a custom carbine .309 JDJ. It weighs a mere 5-1/2 pounds, including a full-sized Bushnell 4200, 2.5-10X scope in Weaver mounts. Chronic back pain from a Vietnam helicopter crash has left me continually seeking lighter rifles to carry over the Vermont mountains. In addition to making custom carbines, J.D. Jones and his SSK Industries are renown for building barrels that turn single-shot Thompson/Center Contender handguns into “hand cannons” that are potent enough for big game at more typical rifle ranges. I’ve been a fan for many years. His .375 JDJ is the go-to rig for handgunning elk, moose and the like, well beyond the capabilities of the .44 Magnum or even the mighty .454 Casull revolver. The .375 JDJ cartridge uses the roomy .444 Marlin rifle case necked down to hold a .375 rifle bullet, and it has taken elephants with one-shot kills. JDJ handgun barrels are mostly 14 or 15 inches long, so it wasn’t a great step up to make barrels 16 inches long, the minimum legal length for a rifle with a shoulder stock. With the Contender action, it makes an extremely lightweight and compact carbine. While T/C offers their own 23-inch carbine barrels in .30-30, 7-30 Waters and 6.8 Remington, JDJ offers much more. J.D.’s .309 also uses a necked down .444 case, and it drives a 150-grain bullet to over 2,600 feet a second from a 16-inch barrel, equivalent to a .300 Savage fired from a full-length rifle barrel. It delivers more than 1,300 foot-pounds at 300 yards with only 11 inches of drop, and mine holds a 5-inch group at that range. While still-hunting deer in the Eastern woods, I may not take such shots very often, but I know the carbine is up to the task. J.D.’s monthly magazine Sixgunner is filled with stories of really big game being taken with handguns, but equally popular is his line of extremely mild cartridges for deer and antelope. These cartridges are very pleasant to shoot in a handgun, and because they use streamlined rifle bullets, they carry plenty of energy out to respectable rifle ranges. Comfortable in handguns, these same cartridges are downright pleasant in carbines. I can’t count the number of friends who have borrowed my 6.5 JDJ and more recently my 6mm JDJ #2 carbine for a youngster’s first deer hunt. Add a good scope and a Harris bipod, and the 6.5 JDJ, whether as a rifle or a handgun, has the accuracy and potency for 250-yard shots on antelope. Again, the key to this performance is that it uses a streamlined 120-grain Sierra rifle bullet, which leaves the muzzle at 2,550 ft/s and delivers a very lethal 1,200 foot-pounds of impact at 250 yards. The cartridges are so popular handloading data for the 6.5 JDJ, .309 JDJ, and .375 JDJ are included in the Hornady Handbook of Cartridge Reloading. The single-shot Contender was originally built to interchange barrels in calibers with modest pressures, namely .357 Magnum, .22 Hornet and .22 rimfire. But it was soon realized that it had the strength for .44 Magnum and even .30-30. 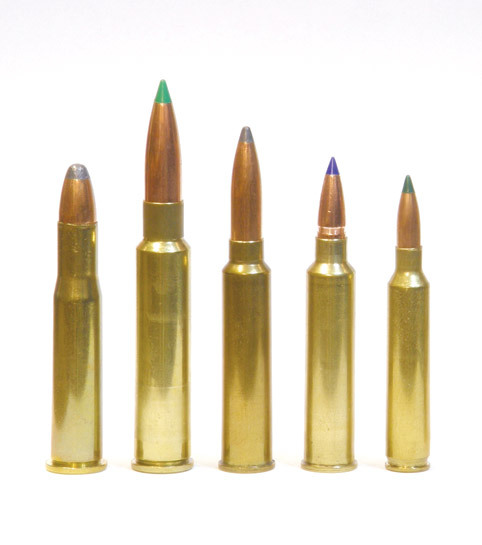 Left to right: .30-30, .309 JDJ, 6.5mm JDJ, 6mm JDJ#2, .204. Here, the limiting safety factor is the force of the cartridge pushing against the frame. This force is produced by the pressure generated in the chamber and barrel by the expanding propellant gases, but it is actually a function of that pressure times the area of the base of the case. That’s why the Contender can handle a high-pressure .223 cartridge, because the cartridge’s base is of very small diameter. The same pressure with a larger .308 base would put too much strain on the action. So, T/C brought out a big brother to the Contender, called the Encore, which is designed for such cartridges as the .308 and .300 Winchester Magnum. It is very popular as a big-game rifle. However, with the heavier action and barrel, it makes a noticeably heavier carbine even than does the Contender, even with the short barrel. Cartridges get their potency from a combination of the amount of powder they burn and the pressure they generate. JD’s potent hand cannon cartridges, the .309 and .375, use the big .444 Marlin case to burn a large quantity of powder but still hold the pressure to the limit of the Contender. Also note that Contenders, Encores and most other break-open single shots are at their best with rimmed cartridges. Rimless cartridge guns use an extractor which slides along the case then snaps into the cartridge’s extraction groove. Open the action, and the extractor lifts the case a quarter inch. Removing a cartridge or spent rimless case requires enough pull to move that springy extractor out of the groove, and reaching in for a cartridge with two fingers and then pulling it against that extractor can be difficult, especially when the gun wears a scope. Fingernails help, but gloves can make the job very difficult. Rimmed cases, on the other hand, literally fall out when the rifle is slightly tipped. J.D.also makes several smaller cartridges, designed to be very efficient and very pleasant to shoot. The efficiency of slightly smaller cartridges is often cited by those who extol the virtues of the still relatively new short magnums. Yet the idea is nothing new. Smaller cases derive more velocity from each grain of powder, and since powder weight adds to recoil, they also kick less than what one might expect. Winchester designed the .225 Winchester case in 1964 as a replacement for the fading .220 Swift. The case has a capacity similar to the .22-250 and a slight rim, making it the perfect case to build mild game cartridges for single-shot actions, with efficiently sized powder space and a rim for easy extraction. The .225 is the parent case for several JDJcartridges, including the 6.5 JDJ and 6mm #2. While the 6.5 JDJ is a fine cartridge, I wanted to try an even smaller cartridge for deer. After reading success stories for the 6mm JDJ #2 handgun in Sixgunner magazine, I tried it as a carbine, and in a short time, I came to really appreciate the little cartridge. Delivering a Sierra 80-grain Blitz bullet, it is an easy 200-yard-or-more coyote outfit. I load a Barnes 80-grain TTSX for deer, and I’ll tell you why. All-copper bullets hold an advantage for big game, an advantage most folks don’t consider. The .243 Winchester has long been considered on the small side yet adequate for deer, delivering one of various 100-grain soft point lead bullets. I’m fond of the Nosler 100-grain Partition. But conventional wisdom has held than an 80-grain bullet is a bit too light for deer. Yet those “acceptable” 100-grain jacketed soft-point lead bullets lose 20 to 30 grains weight as they mushroom, effectively penetrating with only 70 to 80 grains. The 80-grain all-copper Barnes X loses none of its weight as it mushrooms, penetrating with the full 80 grains. For icing on the cake, I can start that 80-grain Barnes bullet a couple of hundred feet a second faster than a 100-grain jacketed lead bullet. The 80-grain .243 all-copper works for me, as does a 130-grain Barnes TTSX .30 in the .309 JDJ (in place of a 150-grain soft point). A couple of years back, I asked J.D. to make me a featherweight .204. It arrived as a 24-inch barrel, small diameter and fluted besides. It groups under MOA. What a nice predator rig to carry. My lightest carbine for deer, a .45-70 with a 16-inch barrel, weighs just 3 pounds 14 ounces, including the Burris Fastfire optical sight. Drilling a large enough bore in the barrel for that fat .45 bullet removes a lot of metal, yet the .45-70 is a mild enough load for that very thin barrel. The .45-70 barrel itself weighs 25 ounces. Hunters who drive an ATV to a tree stand or blind and then rest the rifle forend on a rail may care less about weight, perhaps even saying that heavier is better. American hunters like their magnums, and extra weight does soak up recoil. It’s even common to see a half a box of ammo strapped to the buttstock with an elastic carrier, adding even more weight. And, yes, .22 rimfire competition shooters do use as heavy a rifle as is permitted, the idea being that the heaviness changes an off-hand wobble into a controlled weave. They have the strength, coordination and expertise to press a light trigger just as the sights begin to cross into the bull’s eye. I doubt the same can be said for the typical shooter. The most popular .22 rimfire in America, the Ruger 10/22, weighs but 5-1/2 pounds. Mossberg’s Model 802 .22 autoloader weighs in at just 4 pounds. These are universal squirrel rifles, considered perfectly adequate for hitting a tiny squirrel’s head or chest at 40 yards, a much more difficult target than a buck’s chest at twice the distance. To see how rifle weight effects your ability to shoot accurately from off-hand positions, try shooting an assortment of rifles at a brown grocery bag placed horizontally to represent the kill zone of a deer, set up somewhere between 50 and 75 yards away. Try to hit near center of the bag target without taking the time to really bear down. 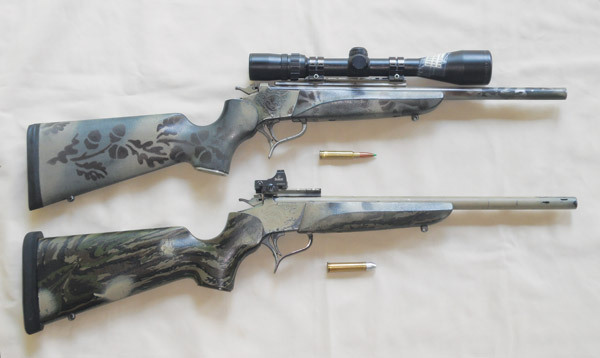 Use the lightest .22 you own or can borrow, moving on up to relatively heavy big game rifles. I suspect you will find no disadvantage at all to shooting the lighter rifles. Sight in all rifles from a steady rest, but hone your shooting skills with off-hand practice, as well as shots from the various positions you may use in the field, such as leaning against a tree. Hone your capabilities and build confidence for the quick shots. Considering there might be a bit more unsteadiness when a trophy buck is in the sights, judge which off-hand shots you should take and when you should instead seek a rest. Experienced still-hunters learn to put the sights in the kill zone and then quickly squeeze the trigger, as ideal shots don’t linger. I take the first guaranteed lethal shot. Experience has taught me when a hold will stay in the right place long enough to put one round where it belongs.